2009 was the year of the tweet.Â I am often asked how to do things by recreational bloggers. Like I have written in the past I am indebted to those who helped me out so I love a chance to show a trick or two. Recently I have received questions about how I feed my blog to twitter and automatically tweet.Â I thought I would take a few minutes and explain this in simple terms. Automating the as many of the processes in blogging will save you time and add consistency to your blog. Everyone who blogs hopes to get read by someone so why not make it easier to send to your readers. One of the methods is to send it to your followers on twitter. 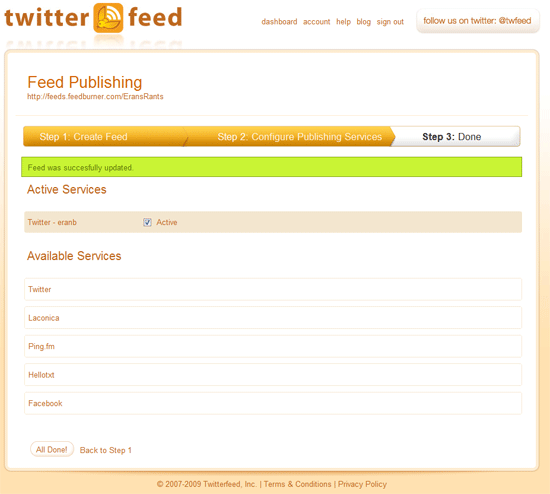 I use Twitterfeed.com to send out automagically generated blog post tweets. Step 1. 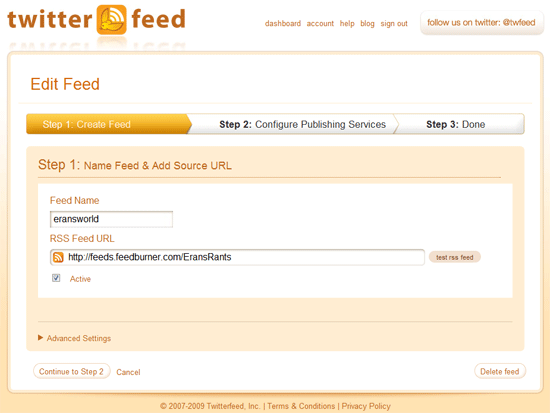 Create an account on Twitterfeed.com This is self explanatory you can figure it out. Give the feed a name… Name it something useful because you never know what will happen with your blog. You may become famous. I click on the advanced settings.Â Because I use bit.ly to shorten url’s or hide urls and for click tracking I select the bit.ly settings. 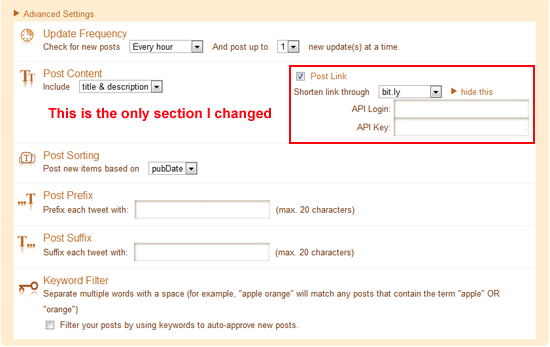 Next to â€œShorten Link Through: bit.lyâ€, select â€œbit.ly settingsâ€. In the fields, enter your log in and API Key. Â On the bit.ly website login using your login or create one. Select tools in the left tool bar and go to Access Link Data Generated Outside of bit.ly.Â There is a link to your API KEY and login information that is needed in TwitterFeed. By adding bit.ly you can now track links that you promote on any website. 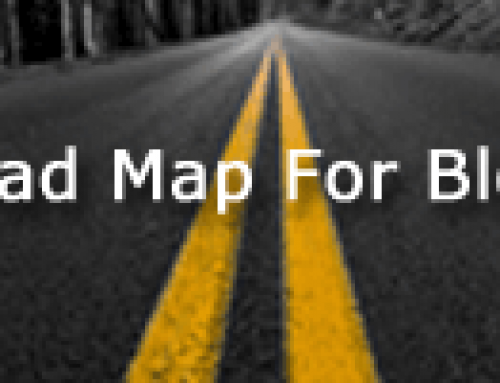 It is great for tracking traffic that you send. I strongly recommend it. Step 3. Click to Step 2 which is will give you a successful message. You can tie other accounts into TwitterFeed like Laconica, Ping.fm, Hellotxt, and Facebook.